Police brutality is getting out of control like we as black people already face a lot of racism, but we shouldn’t be afraid or fear the people that’s suppose to protect us. They also tend to charge black people more time and harsher punishments than a white person that committed the same crime. They even go as far as to stop someone while they’re walking. A lot of people have been pulled over and arrested for resisting arrest and that be their only charge so that means they didn’t do anything wrong to begin with. “The Ferguson investigation reports that every defendant charged solely with resisting arrest was black and that 92% of all resisting arrest charges were made against black people” (resisting arrest is not a crime). Police brutality and blacks being treated different has caused a lot of protesting. A major one is kneeling against the national anthem. Many NFL players has started kneeling due to the way we are being treated. Colin Kaepernick said “I am not going to stand up to show pride to a flag for a country that oppresses black people, and the people of color” (Taking a knee). He also said “To me, this is bigger than football, and it would be selfish on my part to look the other way. There are bodies in the street, and people getting paid leave, and getting away with murder” (Taking a knee), and he is right the police are getting away with murder and thinking it’s okay. We need to punish the police. They need to be fired and sent to prison. They are killing innocent people and getting away with thinking they seen a gun or they felt threatened. It’s not fair to the people who are being killed, and not fair to the families they need justice. The police need punishments. Hands up don’t shoot by Ben is licensed under a Creative Commons Attribution-ShareAlike 4.0 International License. Dear Ben Brown, I am liz from Life Academy and I just wanted to say that I couldn’t agree with you more your article is very strong, I love how you used the example of Colin Kaepernick. That is a very clear statement and I loved how you said it’s bigger than football. It really is there are innocent people are dying because the police are not doing there job right. I agree with you when you say they need to be punished. I have faced many encounters where I am treated differently because of my color of skin. I believe it dosen’t matter if your white brown, yellow, blue, pink we are all human. There is very little to no evidence that supports your claim. You said, “resisting arrest is not a crime” bur resisting arrest is a crime. 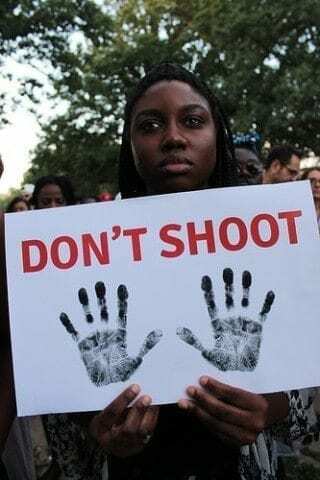 There is no evidence to suggest that Micheal Brown put his hands up before he was shot, and the phrase “hands up don’t shot” is generally consider that be a lie. Which is the title of your article. I am interested with your post because police brutality is a real thing and a lot of people do not notice that it is. I respectfully disagree with some of what you said because after further research resisting arrest is a crime in some states. One thing that you said that stood out to me was “Police brutality is getting out of control like we as black people already face a lot of racism, but we shouldn’t be afraid or fear the people that’s suppose to protect us.” I think this is interesting because people rely on the police to “protect and serve” them but they are doing the exact opposite. Dear Ben Brown, I cannot agree more with you’re point you are absolutely correct and I think your article is very powerful but there are a lot of improvements that can be made. I love that you used facts to support your point, that proves that this issue is real and that it is not an opinion but, I recommend that you use more examples for the innocent lives that were taken for instance, you could use the Philando Castile case or you could use the situation with Treyvon Martin for more of a solid foundation other than that I would say your article was great and keep up your excellent work.